Applying to middle school in New York City can be overwhelming. Parents must wade through dozens of choices and make sense of complex admissions policies. 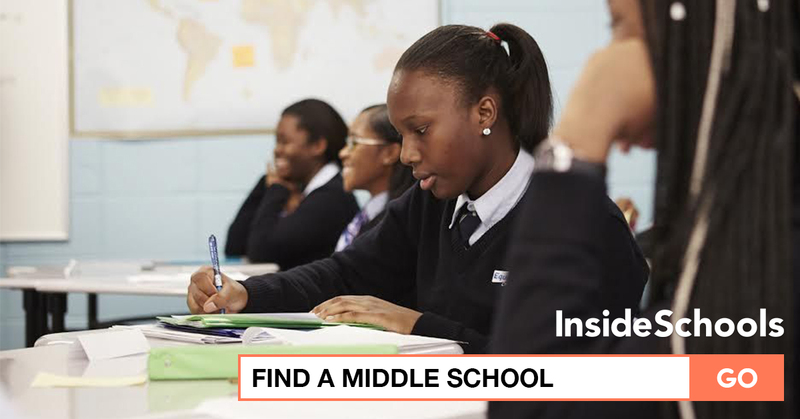 Now, InsideSchools has a new tool to help parents find programs that may be right for their children. Building on the success of our high school guided search, our middle school guided search allows parents to see all the programs for which their child is eligible, taking into account their age, home address, home language, disability status and willingness to take a “gifted” exam or audition. All you have to do is answer a few questions and you’ll get a custom list of schools. Judging a school by test scores alone can be misleading. That’s why we crunched the numbers to rank schools by how much progress students make—a measure the city calls “impact.” If you prefer, you also have the option to sort your results by distance from home and by how well kids do on tests. You can narrow this list to show our recommendations—that is, schools that we at InsideSchools think are noteworthy or promising, based on our own reporting. You can create a “user account” so you can save your search results and compile a list of your favorite schools. We plan to revise the guided search based on feedback from users. So test drive this tool and let us know how it works! InsideSchools, a project of The New School’s Center for New York City Affairs, has been a trusted, independent source of information about the city’s schools since its founding in 2002. We have conducted thousands of visits to New York City schools and interviewed a countless number of parents, teachers and administrators. Our work is made possible with support from the Carnegie Corporation of New York, The Walton Family Foundation, the Booth Ferris Foundation, New York Community Trust, Deutsche Bank and readers like you.